I hope you all had great weekends. We spent ours in Richmond celebrating the wedding of two good friends of ours. It was absolutely beautiful and such a treat to spend time with so many people we love and don't get to see nearly as often as we'd like. As a bonus, the weather was perfect for the wedding; I think that the weather finally got the memo that it was time to be spring around here. Flowers are starting to bloom everywhere and I'm seeing hints of green leaves start to appear on the trees. Hooray! I have a collection of old blue bottles I inherited from my grandmother that I love to put out in the spring and summer. I acquired a few more from my aunt recently as well, so I've got quite a number now. They're all different shapes and sizes, but since they're in the same color family they go together really nicely as a group. They find a new place in our home every year and this year I put them up on top of our antique jelly cupboard that I like to decorate seasonally. 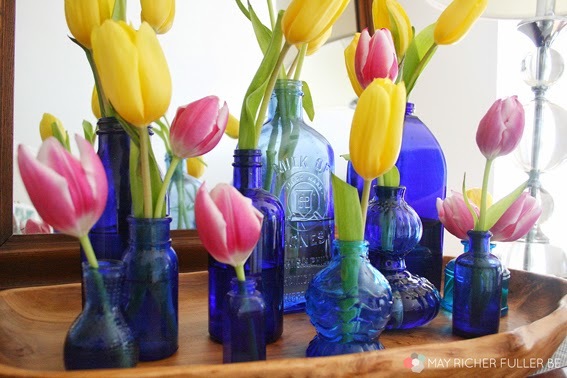 As it turns out, they make great little vases for tulips. I think I can confidently say that spring has officially arrived in our house now! 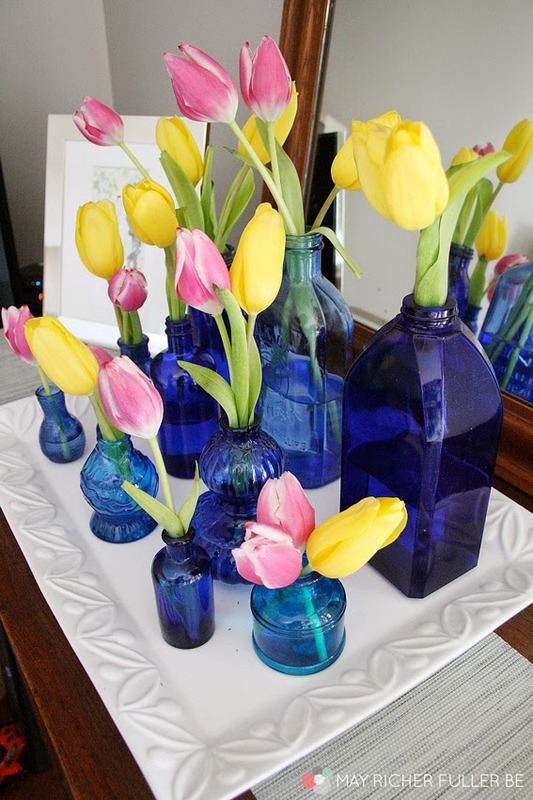 I stuck one, two or three tulip stems in each of the bottles and played around with their arrangement on both a funky wooden tray and a white ceramic platter. actually really loved both, but I think the white one looks better on top of the jelly cupboard - wood on wood is a little too much. What do you think? This kind of arrangement would be lovely as a centerpiece on a table as well. Easter brunch anyone? 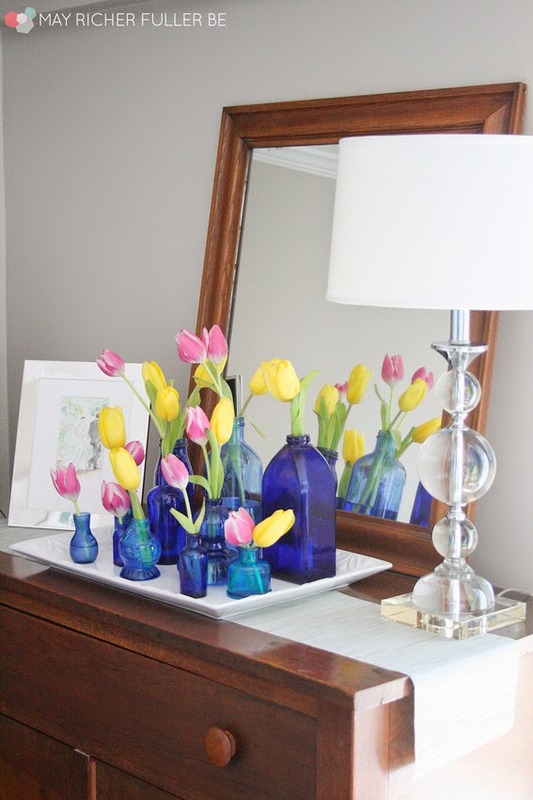 Tulips are so effortlessly elegant. 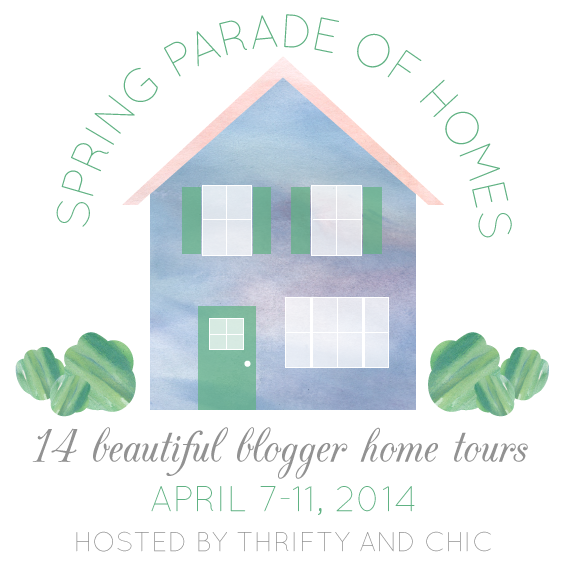 this is so pretty! 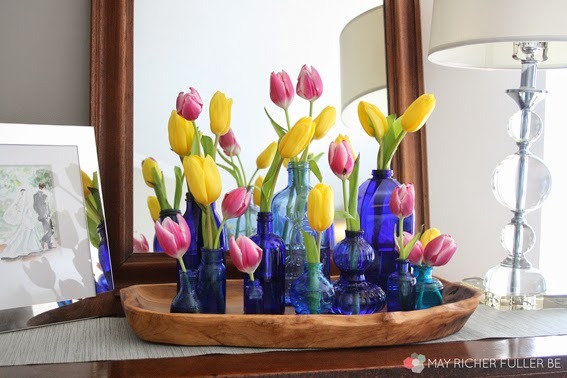 I love tulips, and with the contrast of that blue--lovely! pinning! 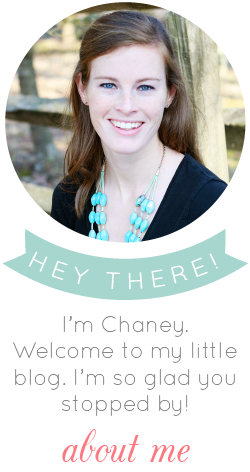 So pretty Chaney! 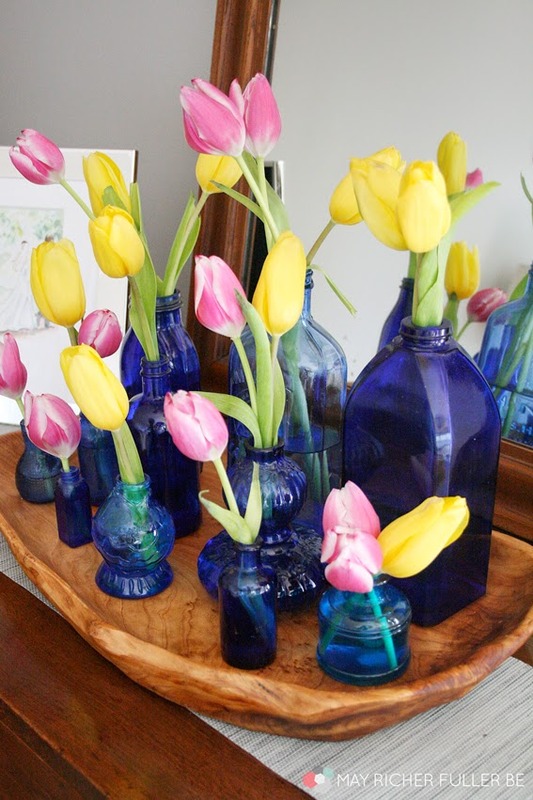 I love them in those vintage blue bottles and on the wooden tray - aren't tulips so stunning and the perfect symbol of spring?! 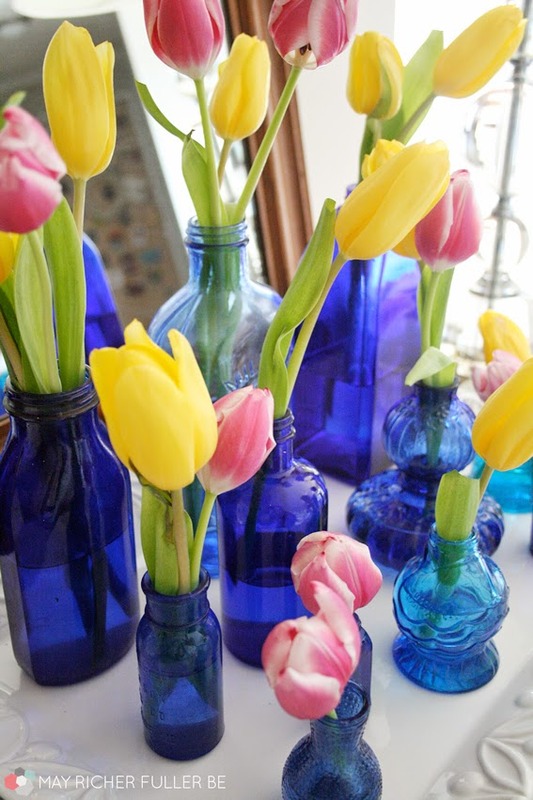 Love the blue bottles and tulips are one of my favourite flowers for spring. 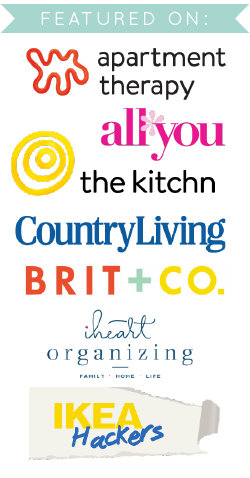 Reputable florists usually belong to a professional group as they will always try to be the best at their crafts. Flower delivery So this is something that you can look at when choosing a good florist. When it comes to photography, flowers are certainly one of the best props that add colours and life into the picture.